From time to time, I receive heart-warming stories of Outliers and their parents. I hope you enjoy them as much as I do. I believe their stories encourage us all to celebrate our accomplishments and to set our goals higher. The excerpt from your book, “The Boy Who Could Run but Not Walk”, which appeared in the Toronto Star on Sept. 10, has intrigued me. I believe I am another Danny, but from another era. Born prematurely in 1935, following a difficult, doctor-assisted, forceps birth, I was rushed to Sick Children’s Hospital in Toronto from Brampton. I was an incubator baby who wasn’t expected to live. After several weeks in the incubator, plus blood transfusions, I survived. Fortunately for me, I had parents who worked diligently with me emphasizing my abilities not disability. It was a tough love-hate relationship for as a child I didn’t always like the exercise programs, which were developed for me. From my childhood to early teens there were daily workouts that included throwing a ball with my idle left arm in the Spring, Summer and Fall; then, bean bags in the Winter at a basement target. It worked. Today, that left arm is only three quarters of an inch shorter than my dominant right arm. In addition to throwing, there were also left-handed penmanship exercises, writing with chalk on a blackboard to give my fingers more mobility. Eventually, being able to tie my shoes was a big deal for a 6-year old heading off to elementary school. I participated in most sports, but never at a rep or all-star level where many of my friends played. My participation in sports led to officiating lacrosse, basketball and baseball where I ran the length of arenas, basketball courts and the paths of ball diamonds. Not being physically able to play on secondary school teams (football, basketball, track and field), I turned to sports writing. 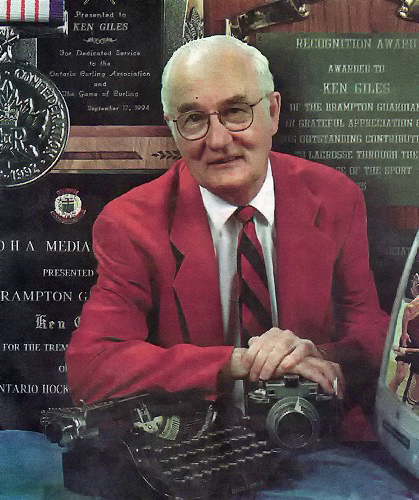 Sports writing became a near 50-year career in journalism in my hometown of Brampton and ended at the Brampton Guardian, a Metroland newspaper and subsidiary of TorStar. Today, the Ken Giles Recreation Centre in Brampton honors me for my contribution to sports in the city. As you describe in your excerpt, there’s still a slight limp in my left leg and my left arm doesn’t swing normally. However, my speech and cognition are normal. Talked early, walked late; however, the perseverance of my parents allowed me to become the best I could be, and for that I am eternally grateful. Unfortunately, my mother who lived until her mid-90s carried both blame and guilt because of her son’s C.P. condition. There should never have been blame or guilt; only pride that she had accomplished so much with me as a stay-at-home mom from the 30s, 40s, and 50s. Hopefully, my cerebral palsy story will help other people with C.P. reach their goals.